It’s official now. New Rs. 50 note will soon be here. The new note’s dimensions will be 66 mm x 135 mm. 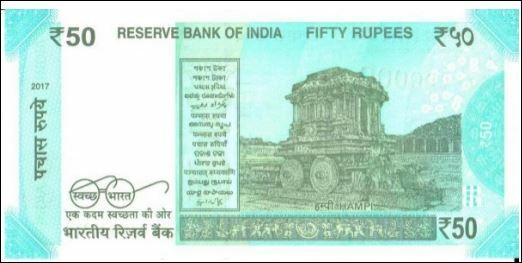 “The Reserve Bank of India will shortly issue ₹ 50 denomination banknotes in the Mahatma Gandhi (New) Series, bearing signature of Dr. Urjit R. Patel, Governor, Reserve Bank of India. The new denomination has motif of Hampi with Chariot on the reverse, depicting the country’s cultural heritage. The base colour of the note is Fluorescent Blue. The note has other designs, geometric patterns aligning with the overall colour scheme, both at the obverse and reverse. Previous articleLeaked Photos of New Rs. 50 Note Are Going Viral. Are These Real?